One thing that cannot be missed is the Jim Corbett National Park Jungle safari. Being home to many wild animals including the Bengal tiger, elephants and leopards, Corbett packs a thrilling experience for those who enjoy wildlife in its natural habitat and not just behind the bars and caged. 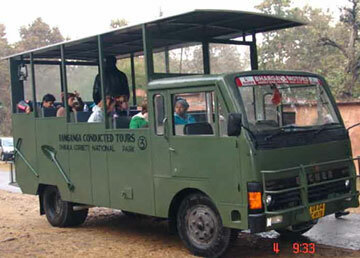 The Jungle safari is done in different regions of Jim Corbett which includes Bijrani, Dhikala, Jhirna, etc. 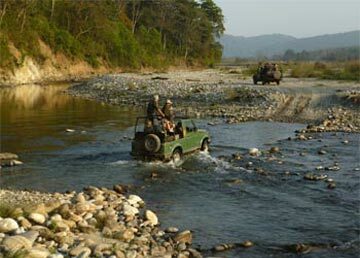 Jeeps to these are available from the Jim Corbett Resorts itself. Explore the immense wilderness and natural beauty of the jungle heaven. Jeep Safari is for smaller groups which makes you rover over the rocky terrains of the jungle. Exploring different regions of the forest depending upon the permit, these jeep safaris are one of the best means to gaze the wildlife. Most of the safaris are open every day at two different time periods, one in morning and another in evening. Dhikala Canter Safari is ideal for larger group of people. Its an open canter which is guided and secured by forest officials for your safety. Bringing along whole team or family of yours? Canter safari is the best option for you. One of the most amazing experiences include Elephant safari. 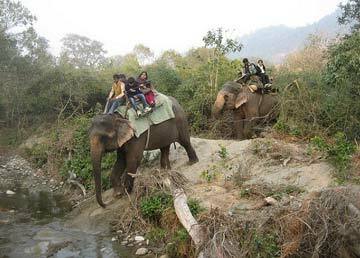 What could be better than exploring the wild on an elephant itself! The slow paced elephant lets you capture every drop of the essence from the nature. Elephant safari is one of the most exciting and joyful rides of all time. The staff associated takes care of all the security during the ride. Therefore, it’s totally made safe for you. CorbettTigerReserve.co.in gives your wishes the utmost priority. Easy booking to Jim Corbett Jungle Safari, Jim Corbett Canter Safari and Jim Corbett Elephant safari are just a moment away. We provide hassle free registration for the safari including all the documentation and verification process. Also you can reserve rooms at the resorts inside the jungle for a night stay.